So this is the first time I am trying to write a narrative based of the games I had. And English is not my first language, so I might make some mistakes here and there. 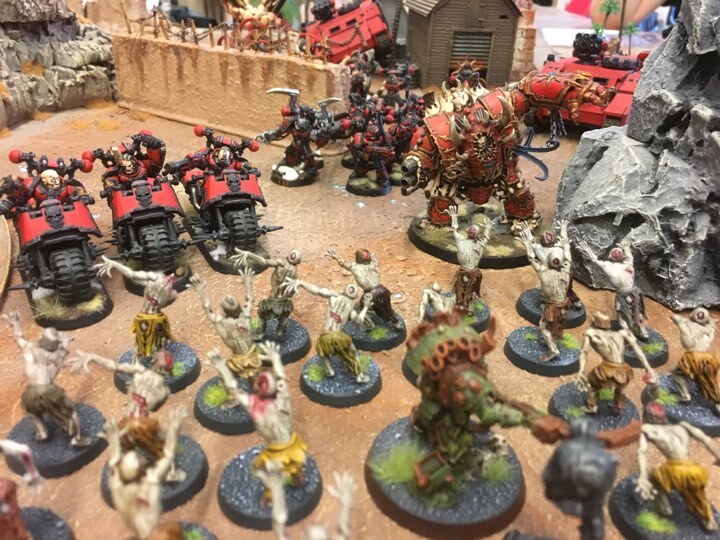 Mind you, this is not a battle report! It all started some time ago. The search for the one Relic that can help us achieve our goal. But all the effort was in vain. We searched for it for to long, and still no result! 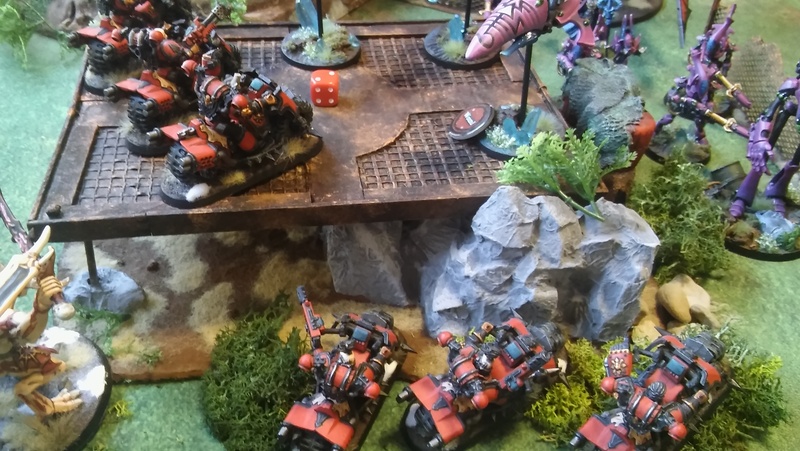 Red corsairs along side Huron Black Hearth has landed on a devastated planet in order to find something very important to their goal. The sorcerer of the fleet has felt massive energy waves from this point. And also the power of Nurgle. Huron decided to personally lead the force, in order to achieve his goal. But when the force came to the point, from where the energy was coming from, he encountered a bad surprise.... Typhus. The air was filed with stench on rotting flesh. The skies field with flies. The planet was gone. Now it belonged to Nurgle. But why is Typhus here? Could it be that he is also after the Relic? Or was he the source of psychic waves? Or where the waves coming from that thing?! He ordered to concentrate fire at the massive blob, that surrounds Typhus. 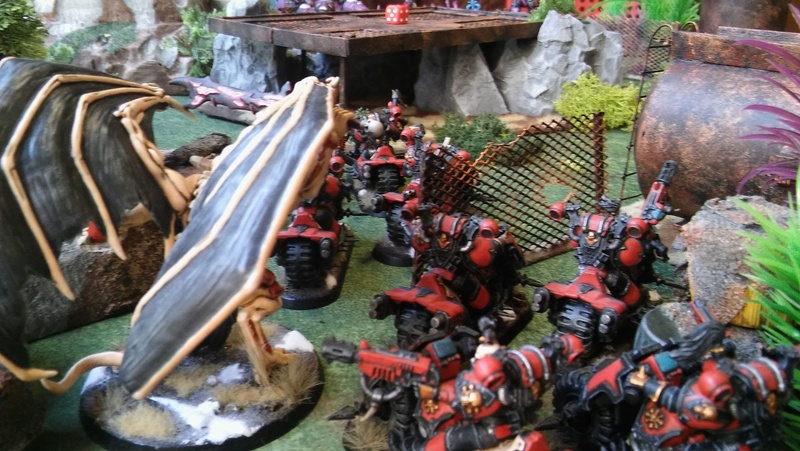 While his squad of Bikers with meltas, and the Heldrake should move as fast as they can and try and take out the Predator. 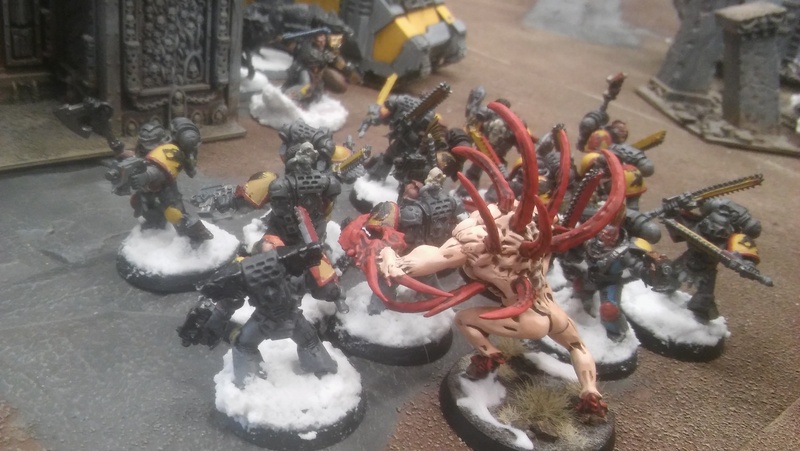 The shooting toward Pox Walkers dident bring any result. They had some kind of power casted on them. And the force was getting closer with every minute. Typhus had the upper hand in this fight. He got the first shoot at the rhino, which was very damaged now. And one lass cannon shot killed a biker from Hurons army. Fortunately Huron had a surprise for Typhus. 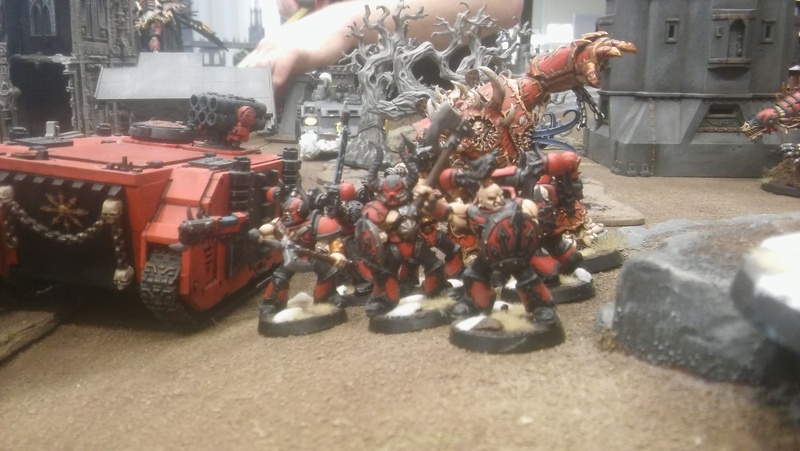 A Daemon Prince, loyal to the Red Corsairs, and one Hellbrute along side with couple of spawns, where hiding from the line of sight of the enemy. And Huron was hoping that he can catch the enemy by surprise. When the time came. Huron gave the command to counter attack. 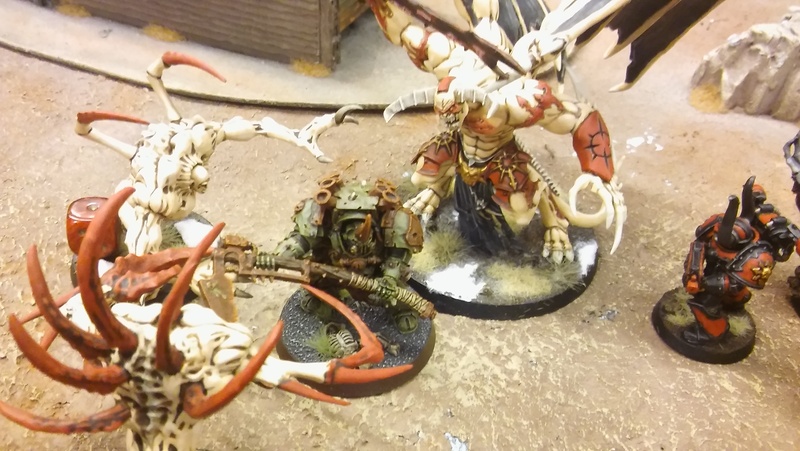 Hellbrute tried to shoot at the Plague Hulk. But the power of nurgle is to strong. The beast just doesent fill a thing and continues moving forward. 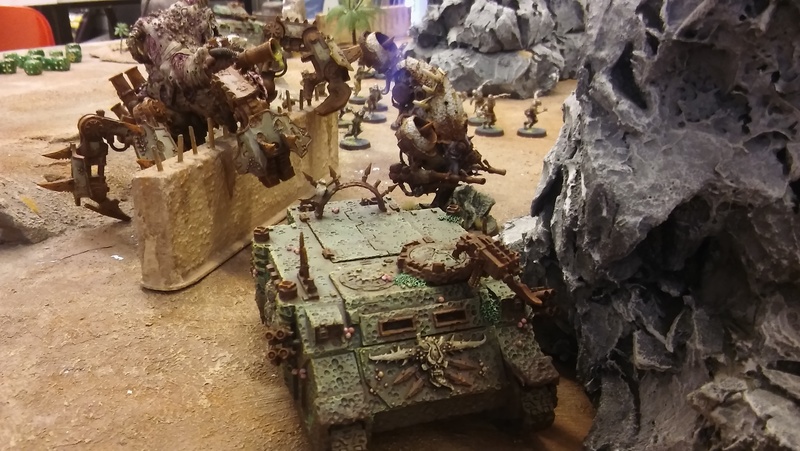 The bikers managed to kill some of the Pox Walkers, in attempt to open Typhus for open fire and Assault. But there was just to many. As last attempt, the first line of Corsairs, charged in to the Walkers. But what they did not expect was Typhus charging in him self. Typhus, single handed, killed all the opposing units. 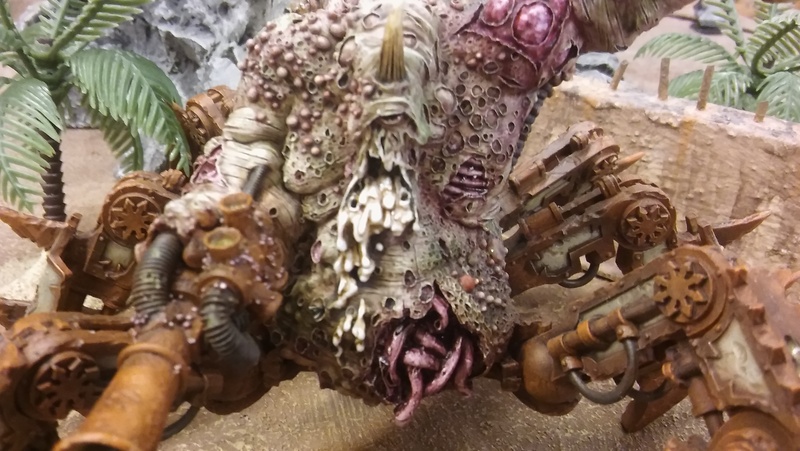 He used some kind of blessing of Nurgle. Which obliterated his enemies in combat. The sight was horrid. 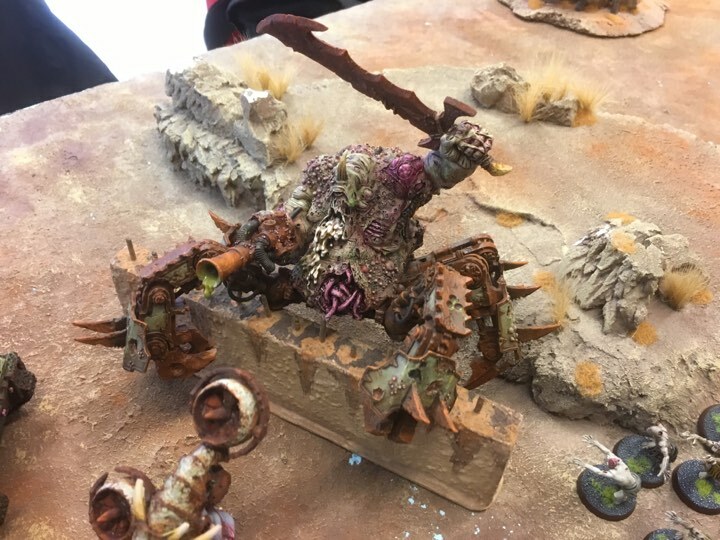 He lost his unit of Pox Walkers, but he won the combat. While laughing in joy, he dident notice that he swiftly was surrounded by the enemy. 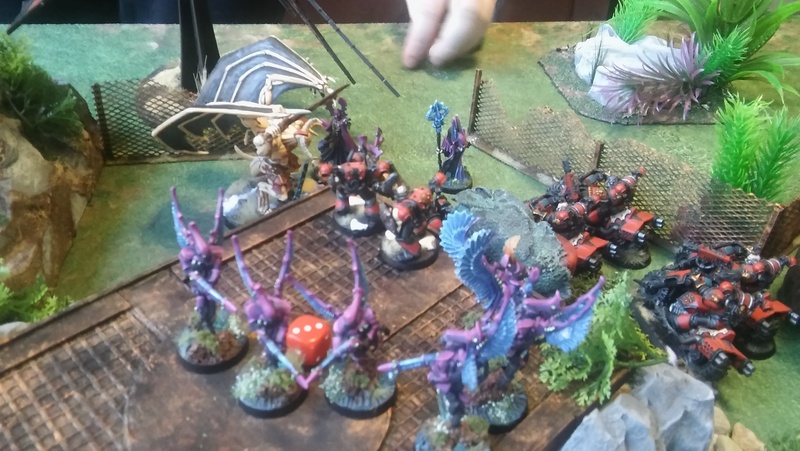 On the other side of the field, Heldrake was flaming the other unit of Pox Walkers, opening the way for the Melta Biker squad. Then he flew in to the Plague Hulk, grabbing the daemon with his claws in a attempt to stop him. Huron Had his own share of trouble. An ambush on him. While his forces where fighting, he got exposed. 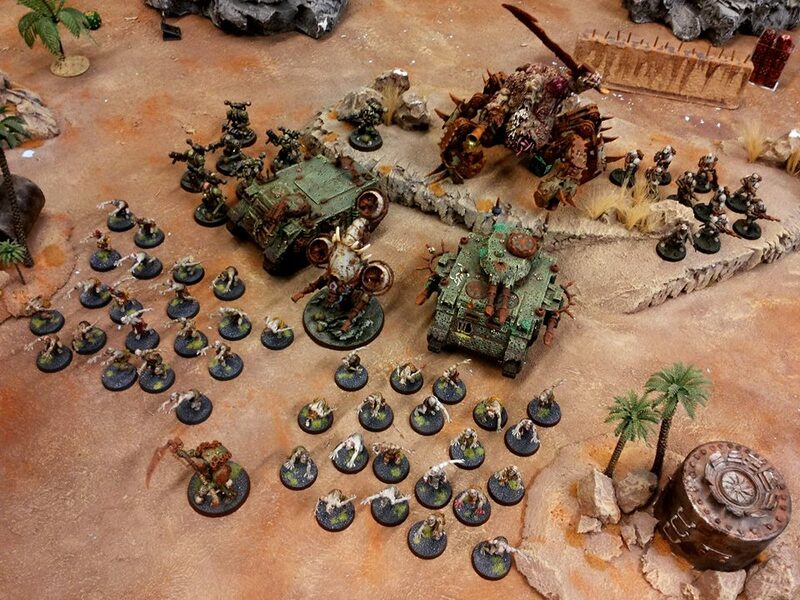 And a unit of Death Guard managed to sneak behind him. The Death Guard charged in to him. 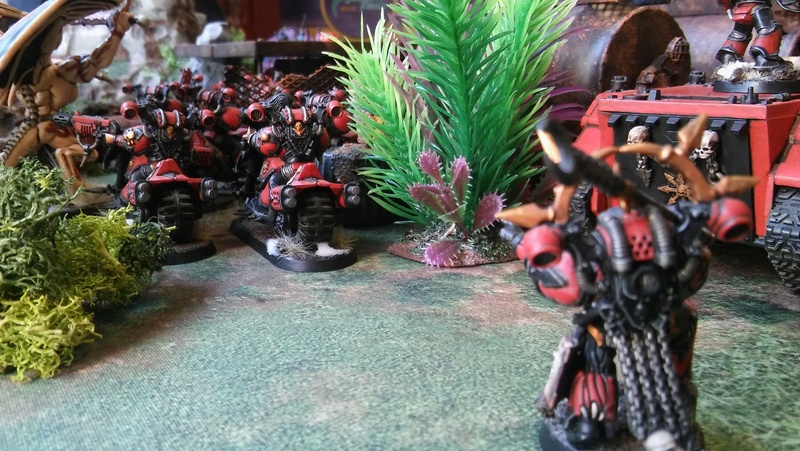 But a near by unit of Corsairs took the charge them selves. Preventing the dammed worshipers to harm their Lord. In the fight, the corsairs where ultimately killed, leaving only the champion alive. Huron went to the enemy, casted a psychic power, and killed every single one of them except two marines. He came closer to the two, and swan his axe to their heads. Killing them both. And then he heard it. 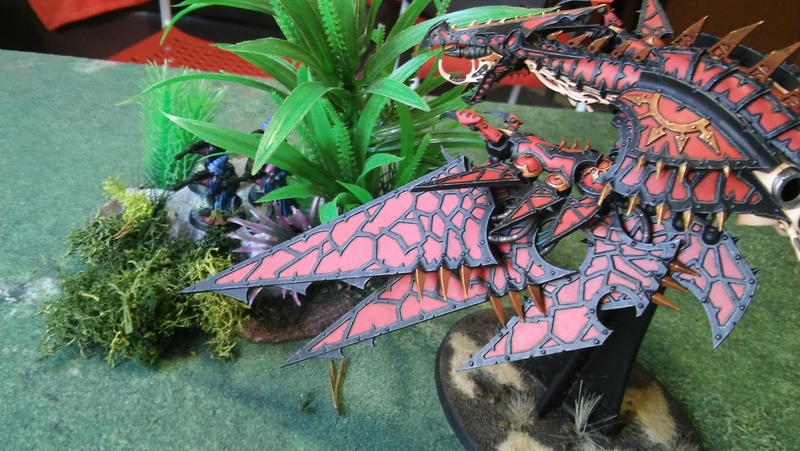 The scream of the Daemon Prince as he vanished. An almost dead Typhus killed his enemies in combat. And was looking towards the surrounded Huron. He had no where to go, so he prepared for battle. And then the haldrake came in behind Typhus. Looking down at him. 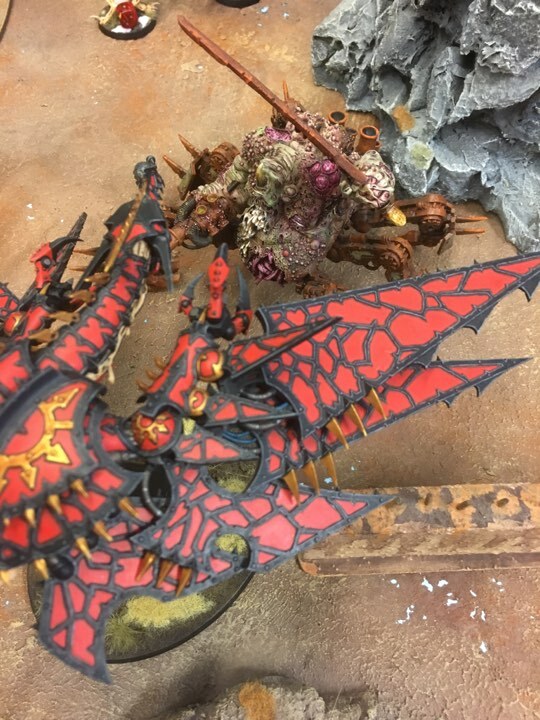 When the champion of Nurgle raised his head, he saw only flames. The flames cleared the path to Huron to escape. The last thing that Huron saw, was the body of Typhus lying on the ground and burning. After the disaster, that was the encounter with Typhus and his army. Huron managed to escape to his air craft, only to find out that his sorcerer was mistaken about the relics location. Infuriated, Huron was ready to burn that fool on the spot. But the sorcerer had good news, that had evidence. The actual location of the relic is on a near by planet. A planet that is well known to Huron. He had an encounter with Imperium forces there. 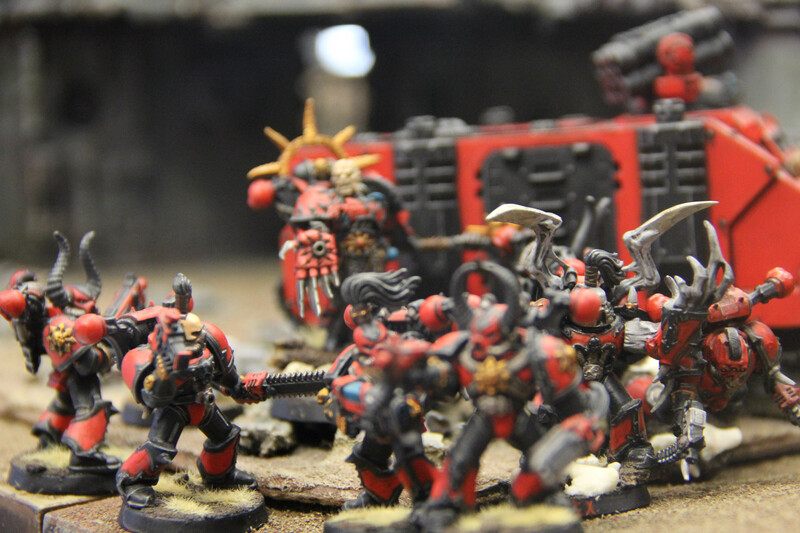 The fight was brutal, but in that fight, the Red Corsairs managed to get the Intel that they needed and retreat. As the sorcerer explained. The planets factory, had an massive explosion. 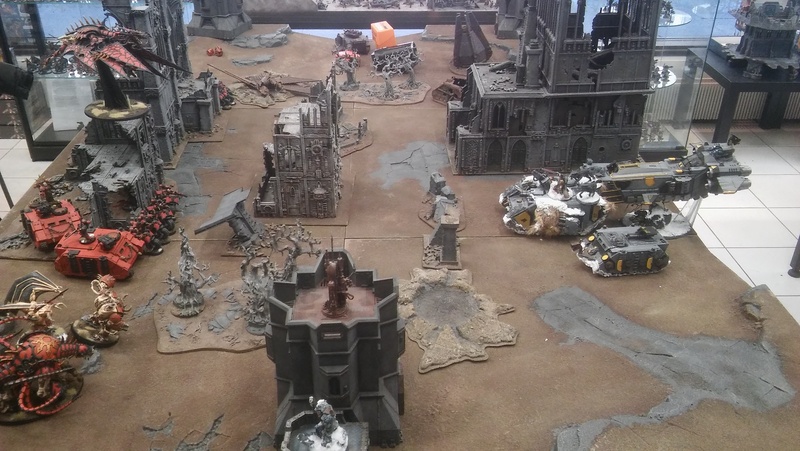 The Imperium forces where ordered to abandon their location. The explosions where getting out of hand, and getting bigger and bigger, releasing toxic waist to the air. This waist reacted with the Relics energy waves, and those waves cause falls ones, that where sent to other planets. But this time there is no mistake. The Relic is located here! And another presence as well. Huron gathered a force, and went to the planet to take what is his. 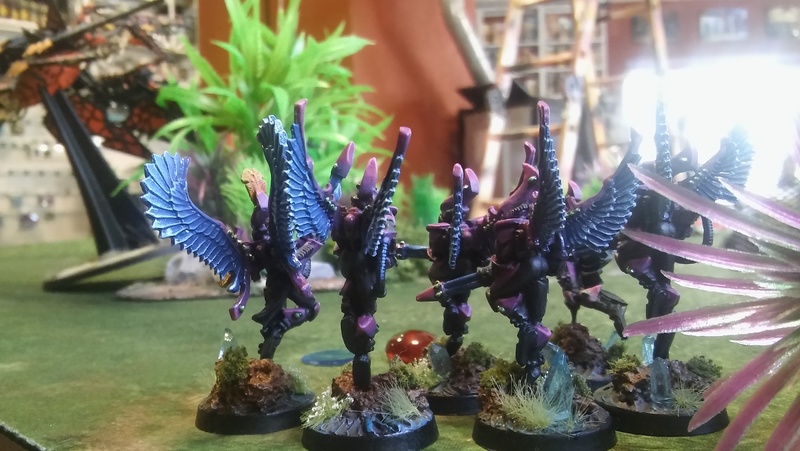 Hi heard about this Xeno cult before. The followers of the Falls Khaine. A force to be aware of. But failure is not an option. By arriving to the spot, they where shot by the enemy scouts, that where hiding in the deep jungle. Huron and his forces needed cover. And the factory was covered with steam, that could grand them some cover. 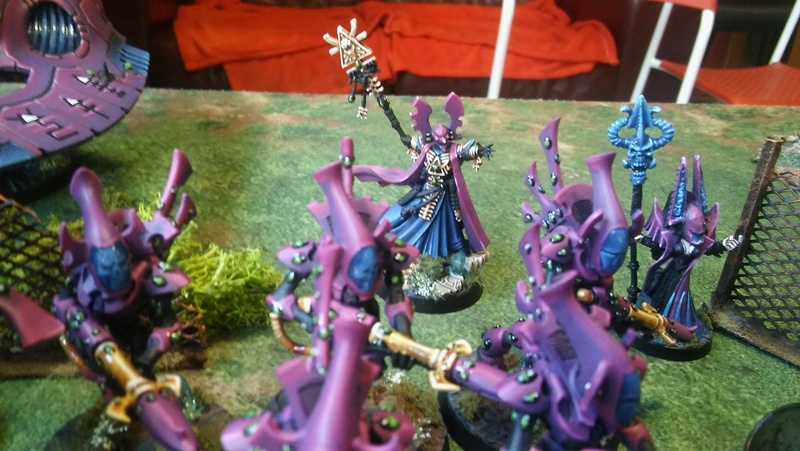 As he ordered his forces to move, a Daemon Prince appeared before him. Huron immediately recognized him. If you fail again, nothing will save you from my wrath. And so they started the attack. 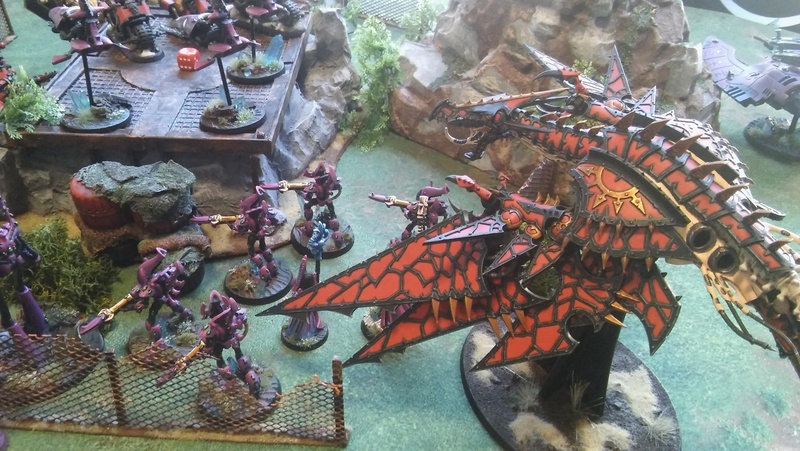 Heldrake located the enemy scouts very fast. And started burning them at once, without a chance of any escape. After the fire settled, only one surviving scout remained. 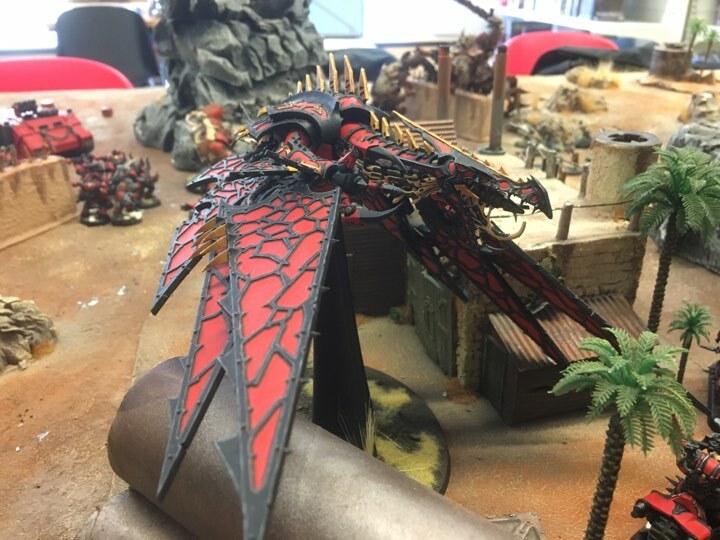 Heldrake flew towards the enemy. Grabbed him in his claws, and ripped the scout in two pieces. Dropping one of the half in front the enemy line while flying over them. While that encounter was happening. 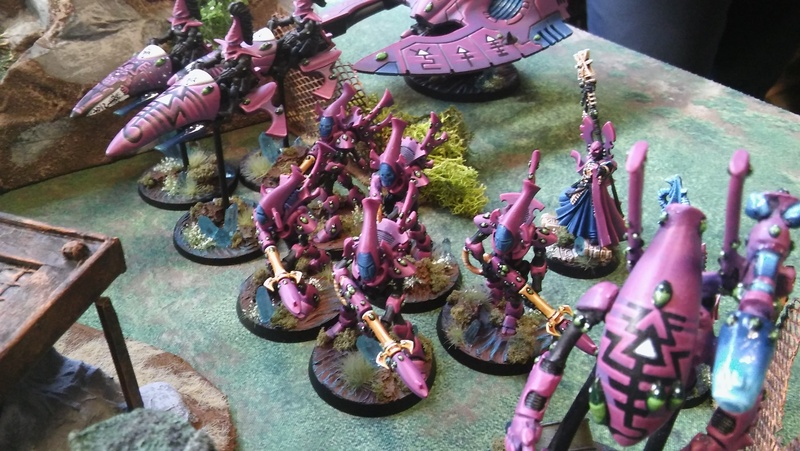 Eldar sent an flanking squad behind Huron lines. But what they did not expect was a chaos spawn. Huron got fooled by Typhus already, and was open for a rear attack. He will not make that mistake twice. Both sided where trying to shoot at each other, but in vain. The steam was so thick, that it was hard to see. But one think was very visible. It was the Relic, and Huron went straight for it. As he got near his goal. A massive explosion struck not far away from his Rhino. 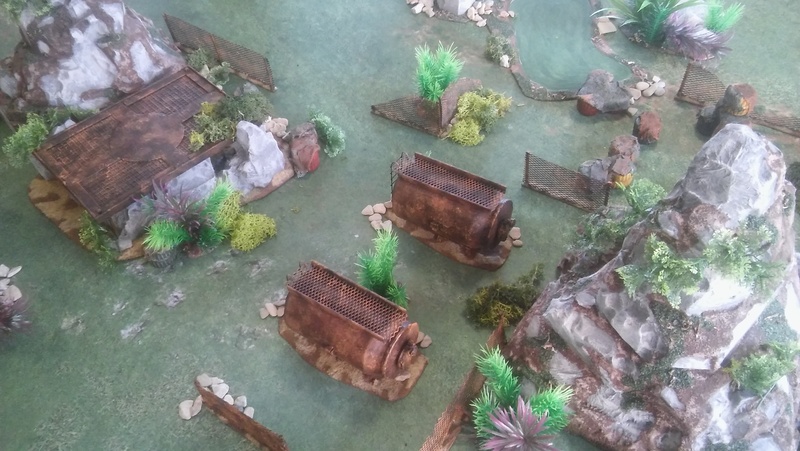 The enemy had some fire power hidden behind the hills. And it dident need any line of sight. As the useless shooting continued, two forces finally met face to face. 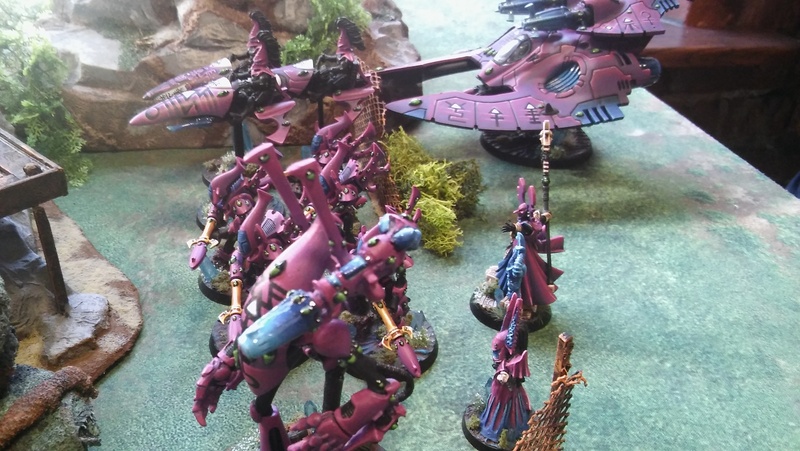 The crazed look on the eldar faces. And those cult like symbols on there armor and vehicles. All of that could strike fear to any other enemy. But not the Corsairs. When the chance came. 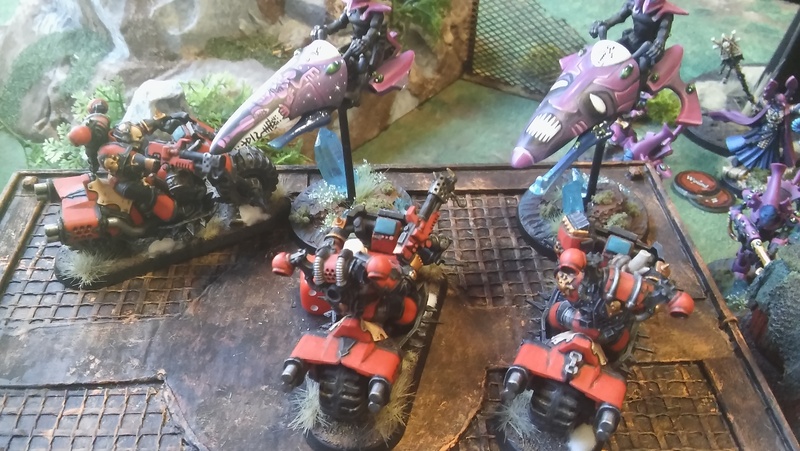 Flamer squad of bikers started flaming the enemy jet bikes. Managing to kill one on the spot. And while he was burning, they immediately charged in to them, and slaughtered the entire squad. 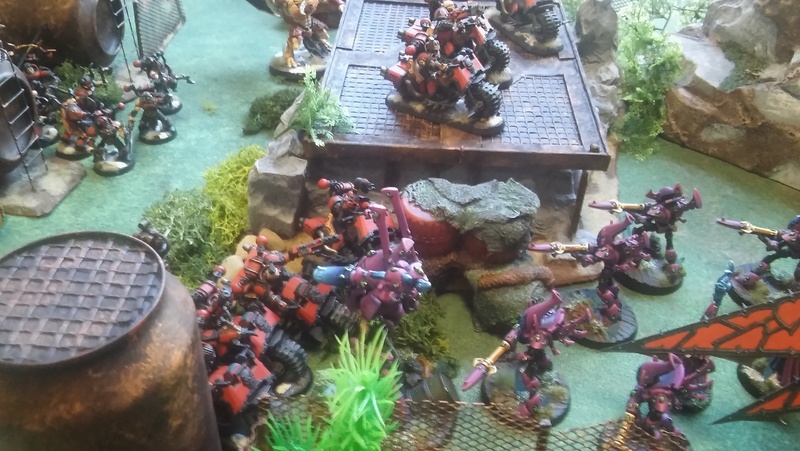 At the same time, the melta biker squad missed all there shots at the Wraith Lord, and also charged in to him in order to prevent any shooting that can come from that thing. 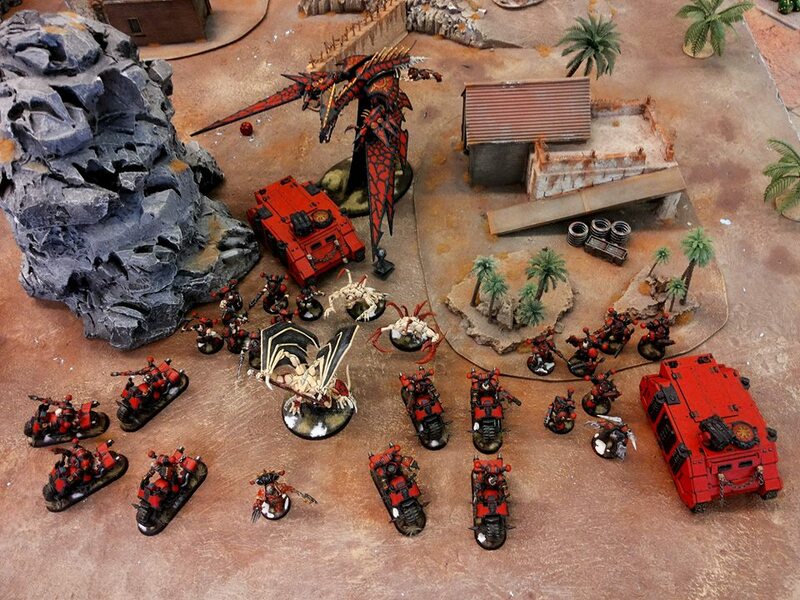 While the Red Corsairs where Attacking. 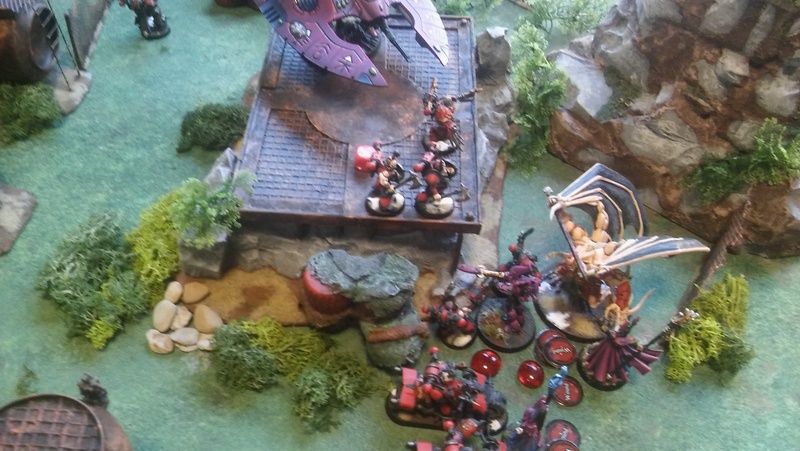 Eldar also tried to counter attack. 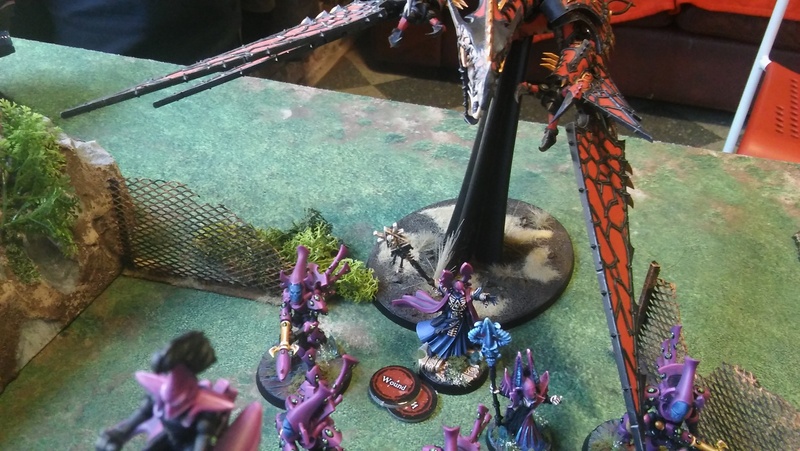 Their Swooping Hawks dropped in in front of Heldrake, trying to shoot him. And the Fanatical Farseer shot at one biker, with its Eldar powers, killing him on the spot. To continue the pressure, and denying the Eldat any chance on getting close to the Relic. Huron commanded his unit to disembark and assist the bikers who where engaged in combat. 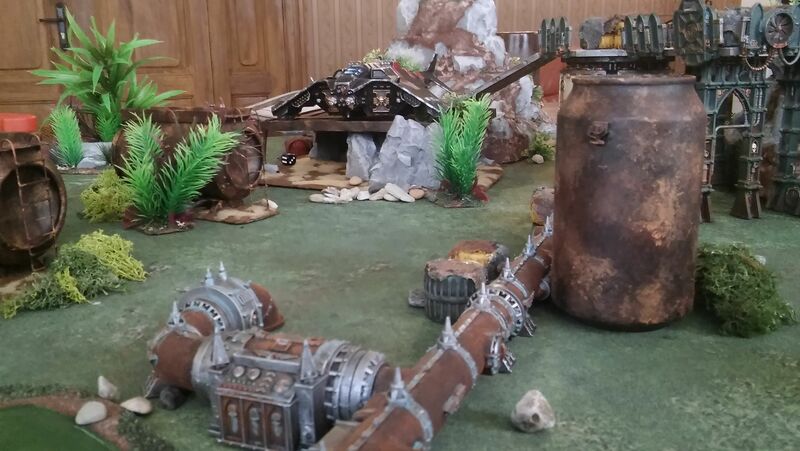 While the second squad should rush forward and grab the Relic with the help of the sorcerer. Everything went quick in the next couple of minutes. 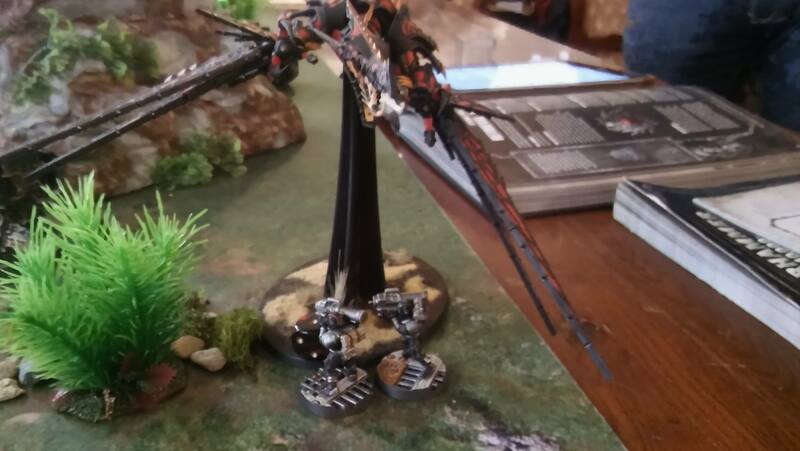 Heldrake ignored the Swooping Hawks and flew directly towards the enemy. And raining fire on them. And assaulting after wards. 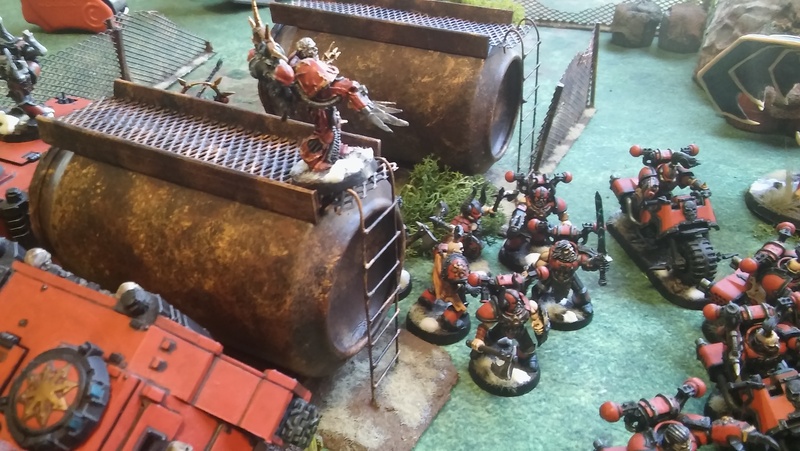 Meanwhile Wraith Guard using their own flamers to kill of the bikers on top of the landing pad. Fire was every where and the temperature was rising with every second. The half dead spawn was still holding the Jet bikes is his claws. And managing to kill one of them. The battle field was in chaos. Fire spreading every where. No visible targets to shoot. Swords, power sword, power fist and all other close combat weapons was heard every where. The Red Corsairs where pushing forward. And then in happened. The enemy warlord unleashed a power that every one felt. A massive power that can rival the one of Eldrad. He was about to use it. 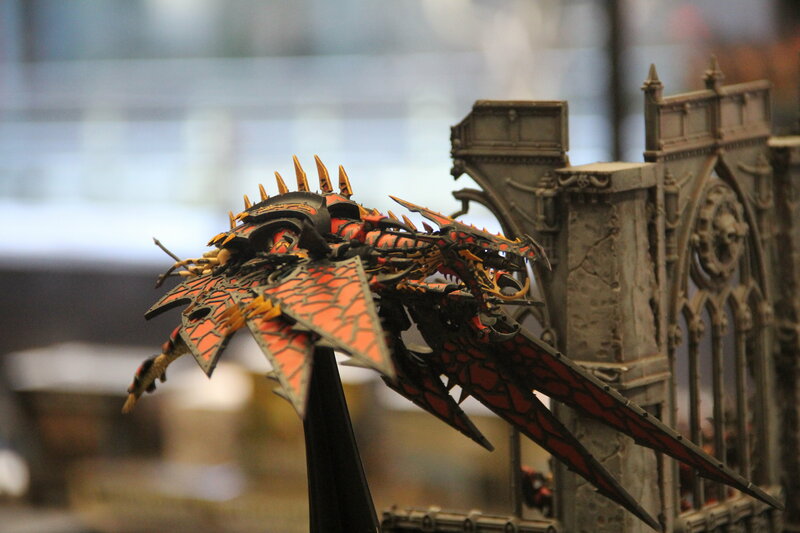 But was stopped by the Daemon Prince. 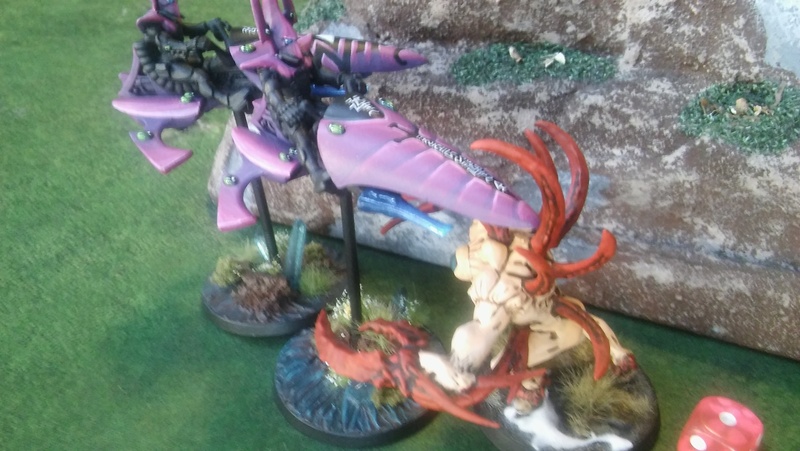 Hi flew in, and grabbed the Psyker with his talons, tossed him on the ground and was ready to finish him of, but was pushed back by an energy wave from the enemy. Daemon prince dident want to give his prey any time to use that power, so he continued pressuring him. 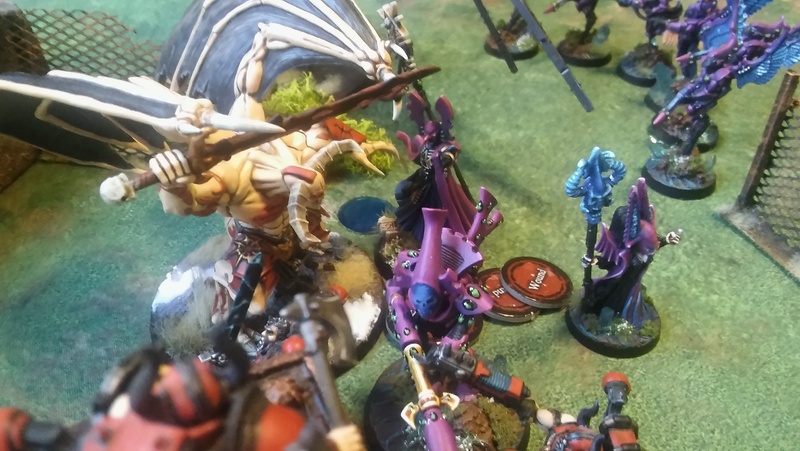 Huron was closing in, and wanting to join the Daemon Prince and help him slay the enemy Warlord. He felt the immense power coming from that Eldar, and wanted to get his head as a trophie. As he was closing in, he was ambushed by swooping hawks. 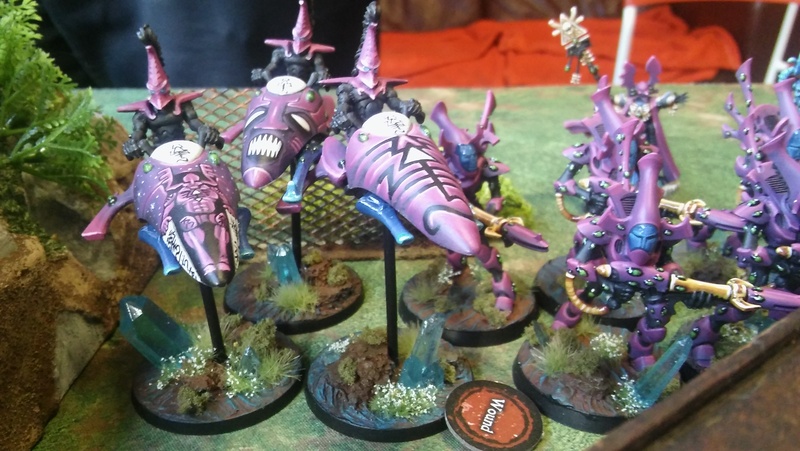 They flew over the melta biker squad, that just killed of an Wraith Lord, and dropped a bomb on them getting one with the explosion. And then shooting Huron him self. Hurons armor saved him from every single shot. And in return he burnt the entire squad, expect their leader, which he cut down with his ax in combat. While Huron was busy. 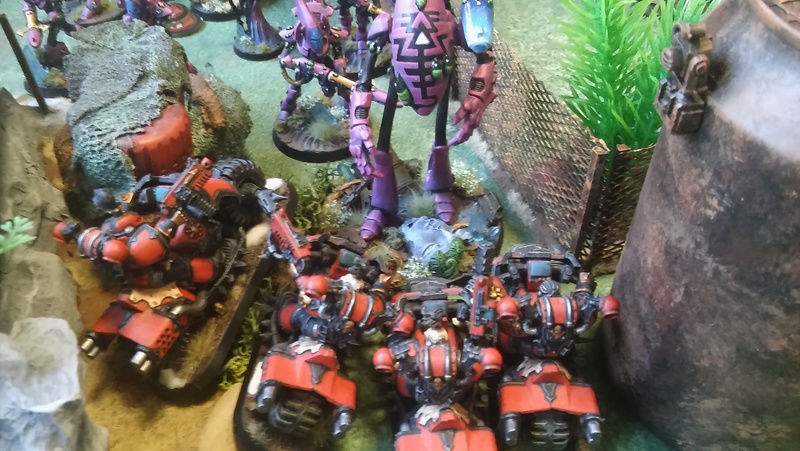 Eldar biker managed to kill of the spawn and headed toward the enemy lines. But was surprised by the sorcerer and killed of by his magic. 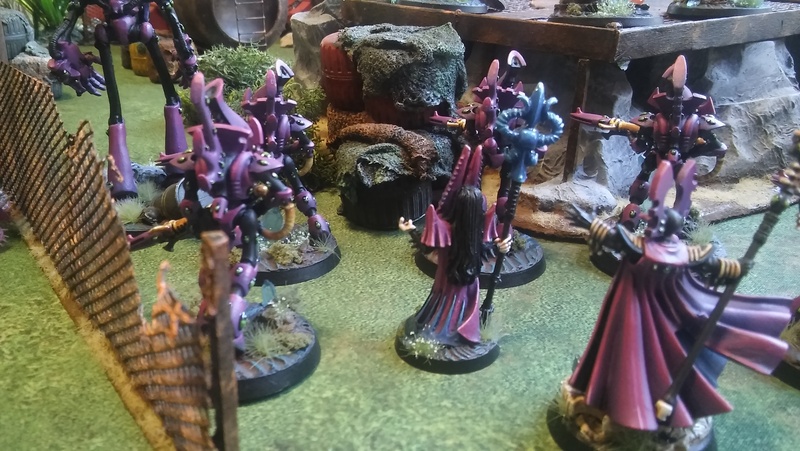 Huron saw that Daemon Prince is still fighting that Eldar, and once again went toward him. But was stopped by a Night Spinner that came out of no where and shot him in the back. Huron dident feel a thing. He turned around to face the tank. 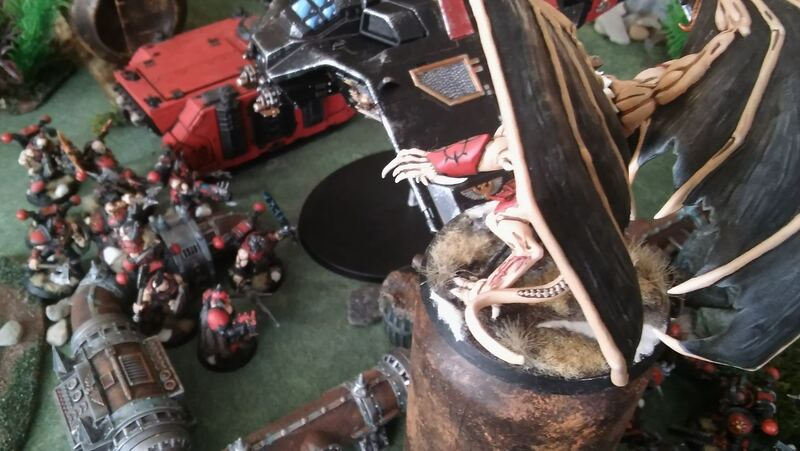 Suddenly, his Heldrake landed on the pad next to him. Huron stretched forward his right hand, and together with Heldrake unleashed a massive flame. The Night Spinner was completely destroyed. He once again turned toward the Daemon Prince, only to see him standing alone. He managed to defeat his enemy. But by the end, the Farseer intervened, grabbed her master and escaped in to an opened portal. Red Corsairs casualties where minimal. While the cult lost every single unit, only leaving the Leaders who managed to escape. But what most important, is that Huron got his Relic. But the question still remains. Why where Eldar after it? And where they responsible in the bases explosion in the first place? Holding the relic in his own hands, Huron was about to leave. When all of a sudden an Imperial ship landed on the bases landing pad. The ship was covered with Deathwatch symbols. 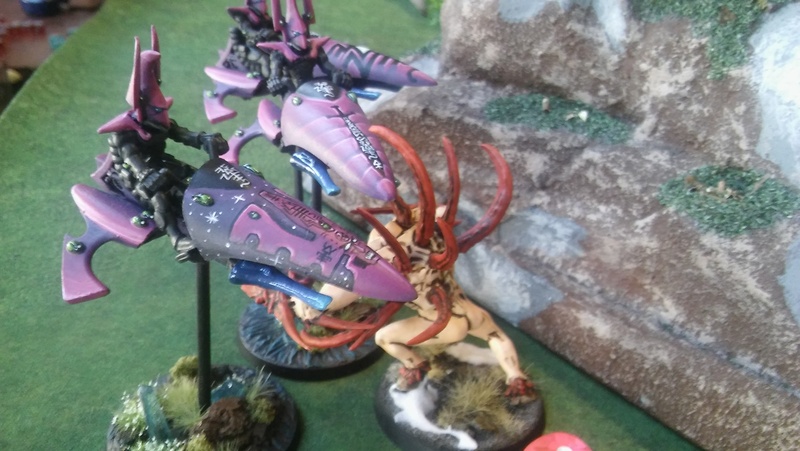 Those fools where after the Eldar scum that where just destroyed. And they dident expect to encounter Red Corsairs here. Huron had to deal with them, as he dident want the Imperium to know that he was here. He gave the Relic to his Sorcerer and ordered him to retreat with it. While he will deal with the Imperials. 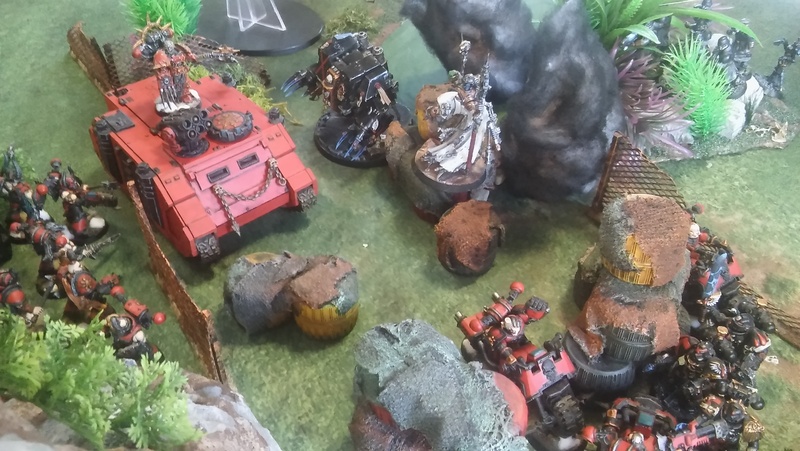 Still intense from the last battle, the Heldrake and a squad of bikers dident loose any time, and swiftly got to the enemy. 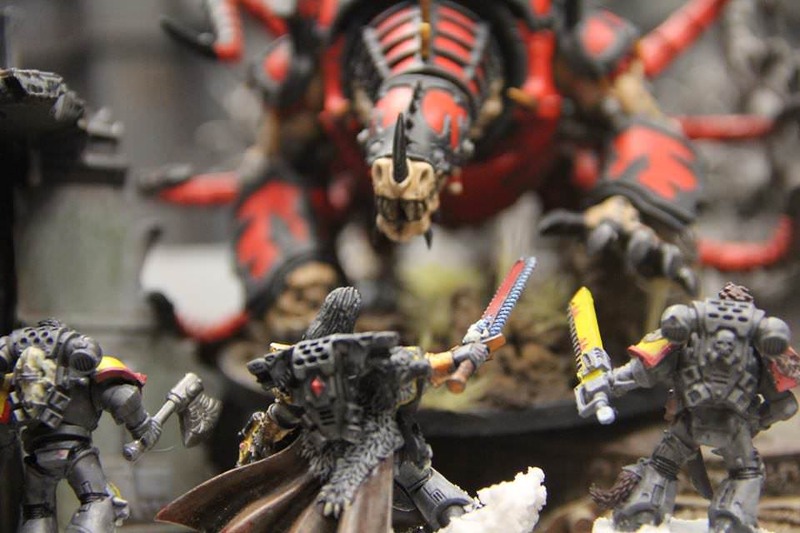 The Heldrake located the enemy Warlord, it was a Watch Captain. 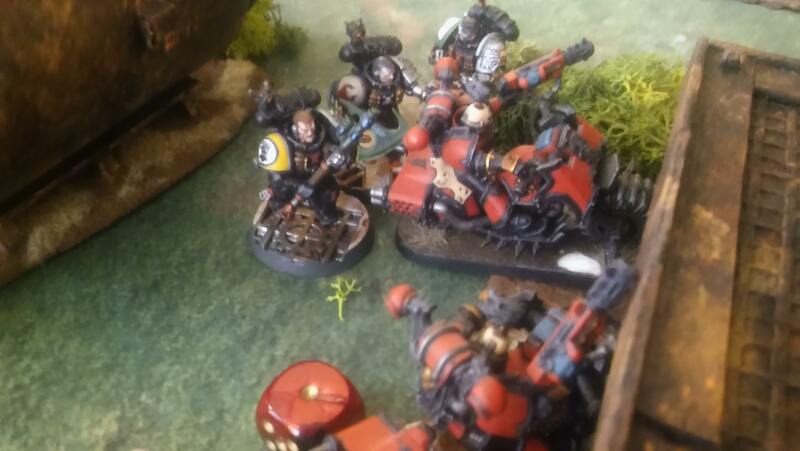 The Daemon Engine tried to burn him alive, but the marine managed to avoid the flames help to the terrain. Then he noticed that the beast tried to grab him with his claws, and once again, he managed to avoid it. He flew up with his jump pack and landed behind the beast, only to meet his enemy eye to eye. 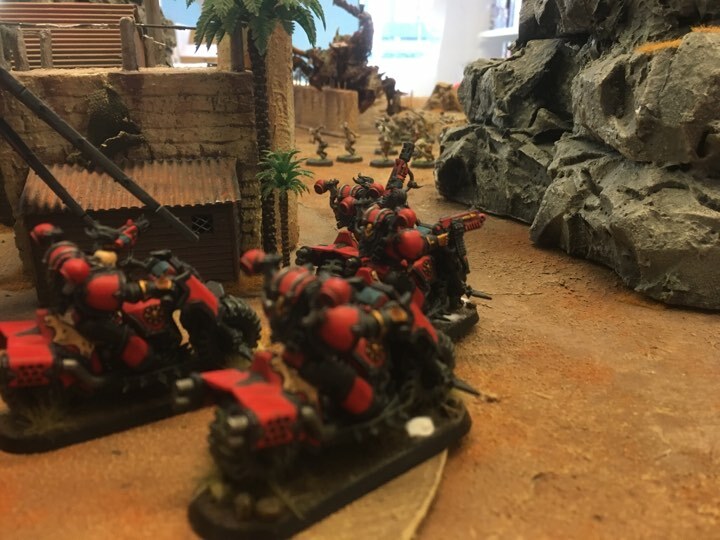 The bikes tried to shot down a Razorback, but failed. 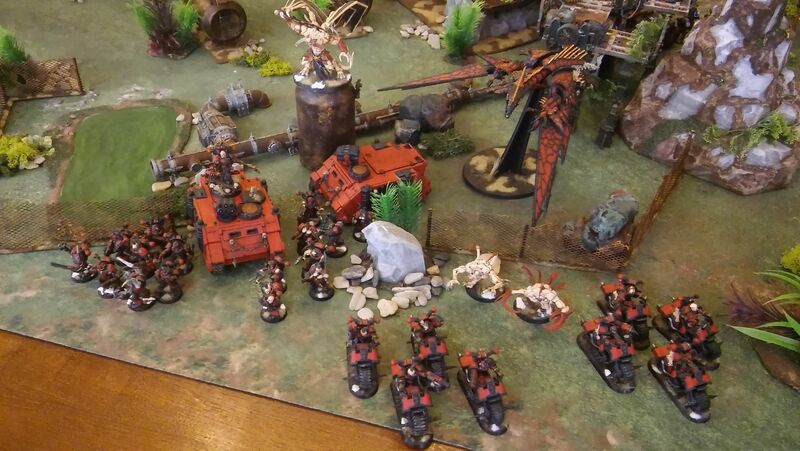 In return they where attacked by Deathwatche marines, and they where armed heavily. The encounter dident go according to the Deathwathc plans. Bikes managed to dodge a lot of swings from all those power axes, and even manage to decrease the numbers of the enemy squad. 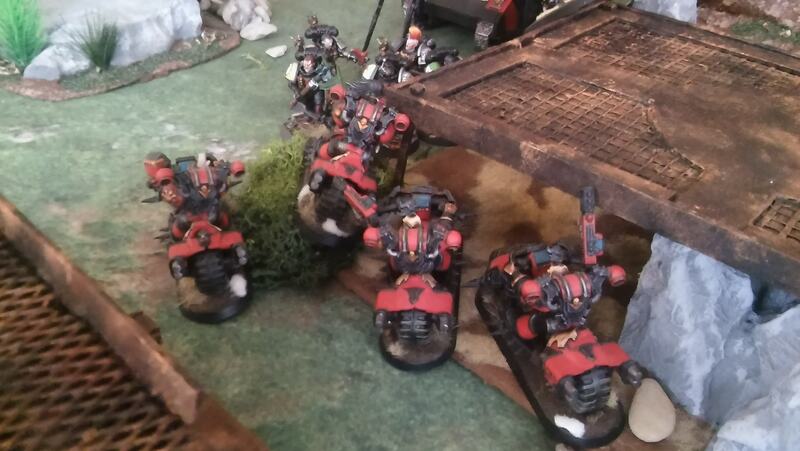 At the same time the Deathwatch ship flew over the other squad of bikers, and killed of two of them. The ship aimed strait towards Huron and his main numbers. 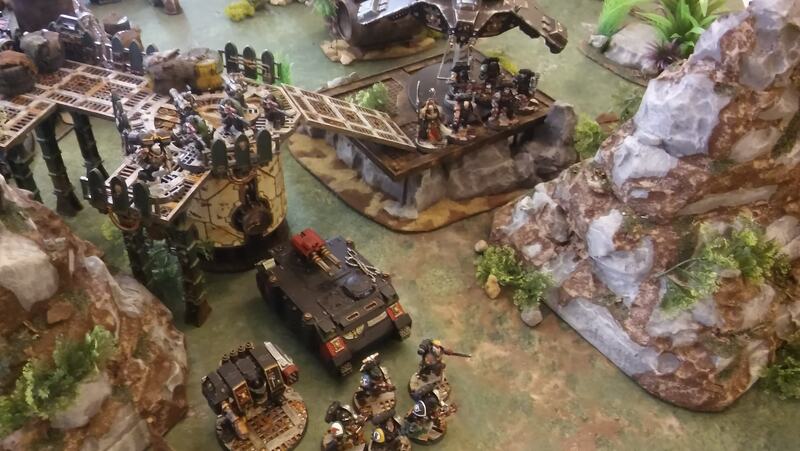 What the Deathwatch dident expect where that Huron anticipated that attack. 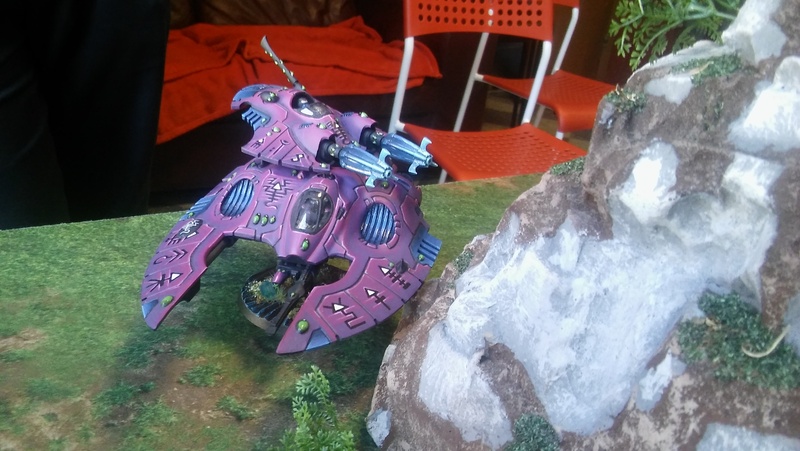 When the Ship flew closer, the Daemon Prince flanked it. The chaos marines disembarked form their rhinos, and so did Huron. The Corsairs lord, along with Daemon Prince, started casting devastating powers against the ship. 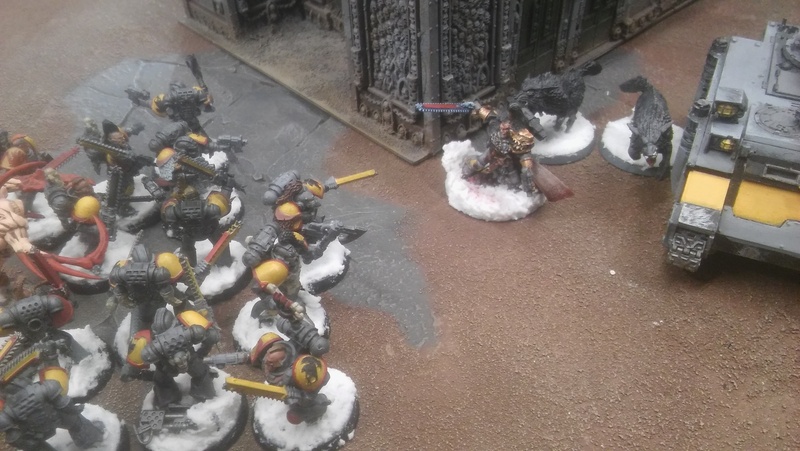 Followed by a rain of plasma and bolter shot from the other squads. The counter attack worked, and the ship went down blazing. 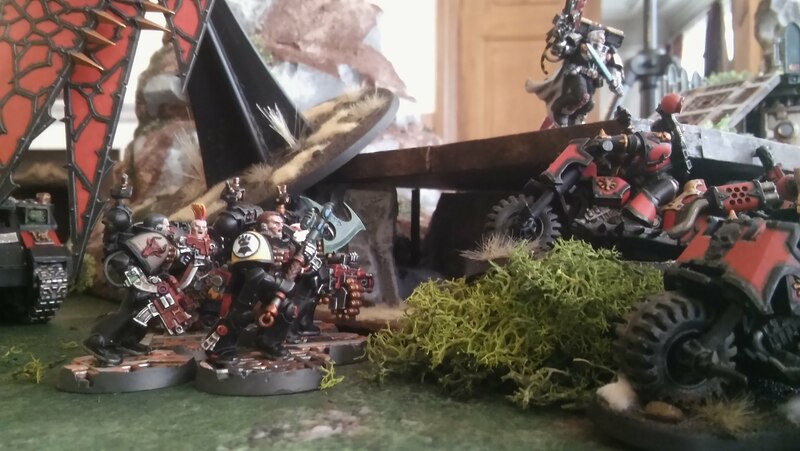 From it emerged one more heavily armed squad of Deathwatch marines, and their Captain. Corsairs dident waist time and attacked the devastated squad. With the Prince flaying next to their captain and ripping him apart with his talons. While the watch Captain tried to push back the advance of the Corsairs on his side. He noticed the devastating defeat of his forces by Hurons claw. 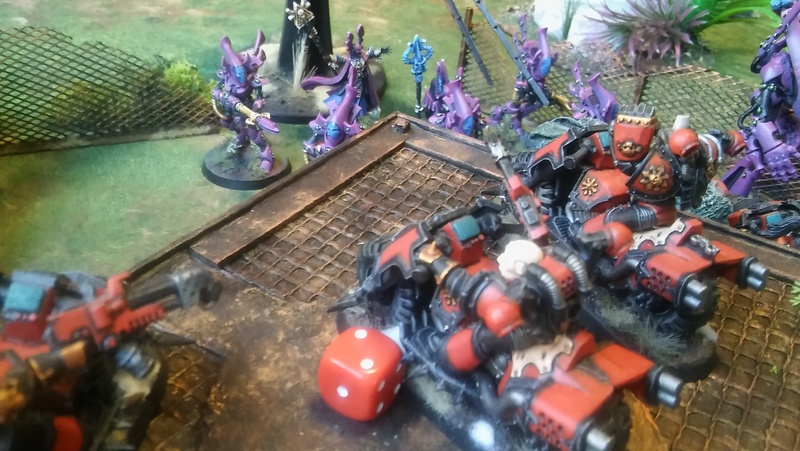 He had no other option but to order he last remaining units to retreat, and report this accident immediately. His marines decided to stay behind, and try and hold of the enemy for their Captain to retreat. The last thing that the Watch captain saw, was his Dreadnought shooting at the enemy rhinos, damaging them and preventing from following. And the fierce Heldrake ripping apart his trusty marines. The Watchcaptain knew, that he will revenge his soldiers. And this is not the last time he encounters Huron. 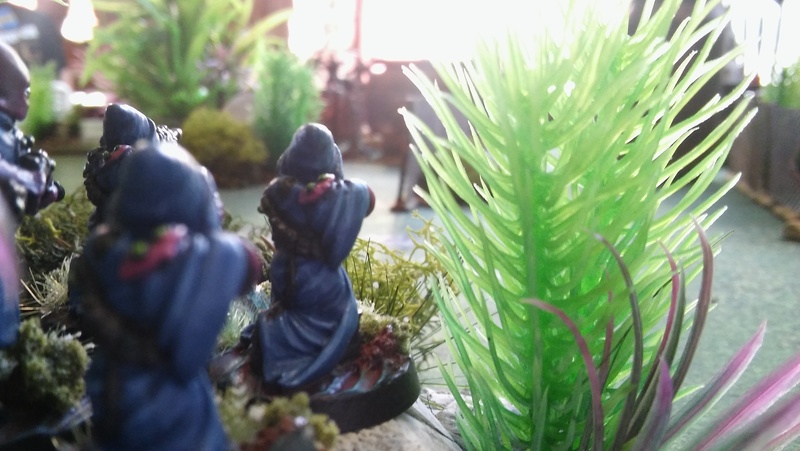 After recovering the Relic, and bringing it to safety and securing it, the Sorcerer of the Red Corsairs began analyzing the Relic true nature and hidden powers. Huron was heading towards his Planet of operation. 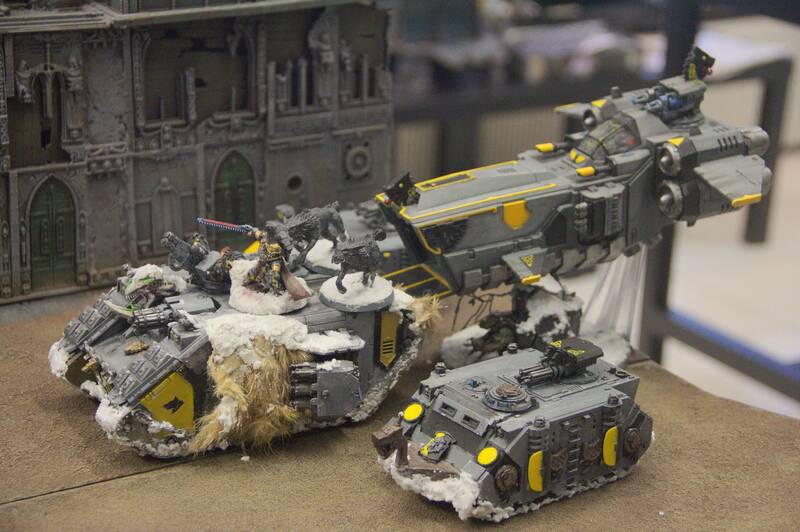 When they noticed that a Space Wolves ship was on their tail. Not wanting any unnecessary attention, Huron decided to land on a near by planet, and prepare a trap for the Space Wolves. Little did he know that the trap was already set, but he was the target. Upon Landing on the planet. 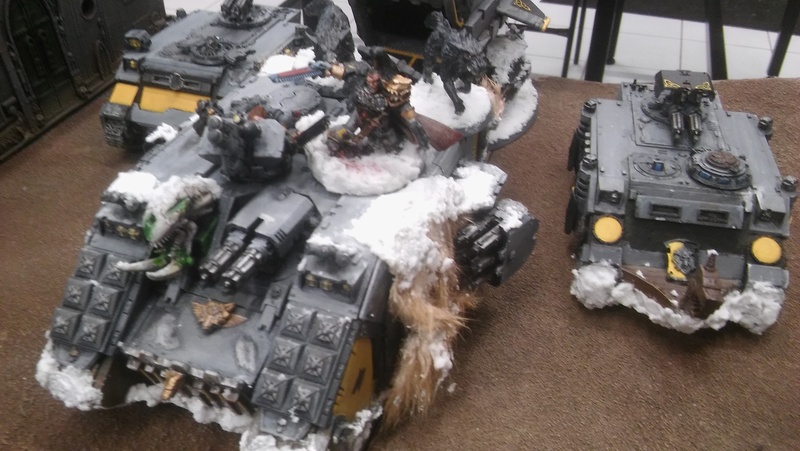 Hurons forces where ambushed by Space Wolves army. And leading the army was non other then Ragnar Blackmane him self. Ragnar wanted revenge on the Tyrant for stealing his space cruiser. And he was determent to get it back. A space battle accrued between the Corsairs and Wolves fleets. So Huron dident have any other choice but to battle Ragnar. 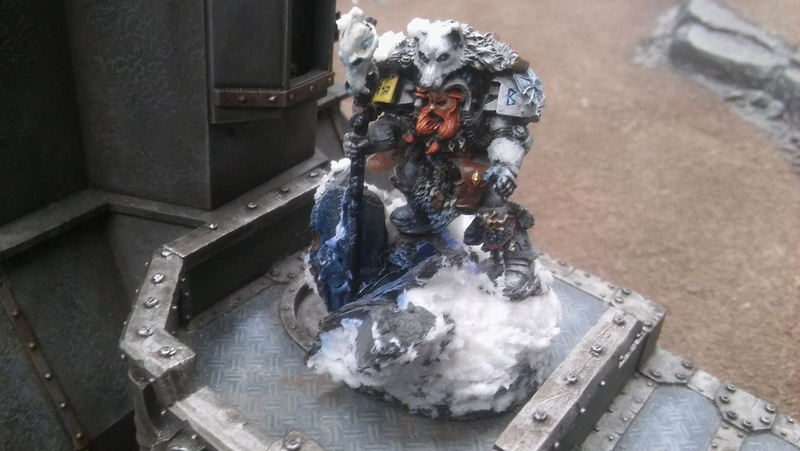 While giving out orders to his forces, Huron was interrupted by the Space Wolves flyer. 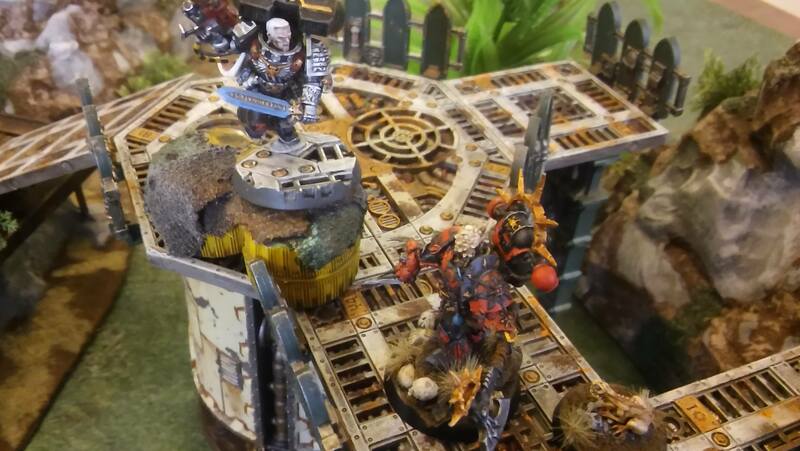 A storm wolf flew up strait to Red Corsairs line and started concentrating his full fire power at the Heldrake. Huron saw how his Drake was suffering damage from the airships guns. 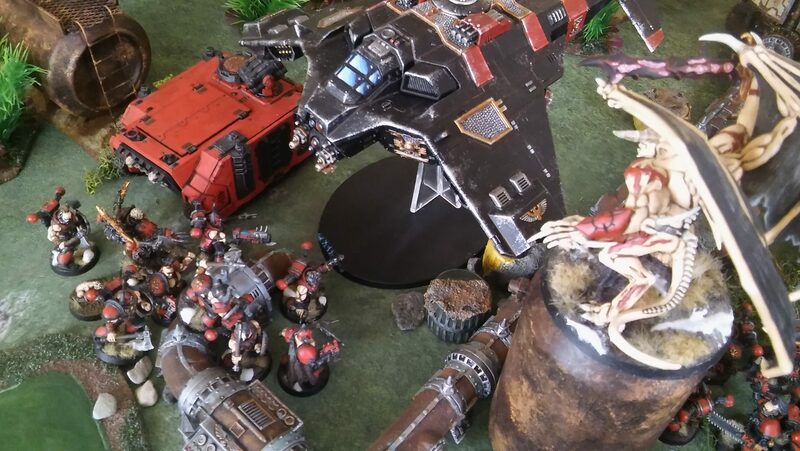 And he was prepared to loose one of his most important assets, but then the Storm Wolf missed a vital shot and the Heldrake managed to fly off. 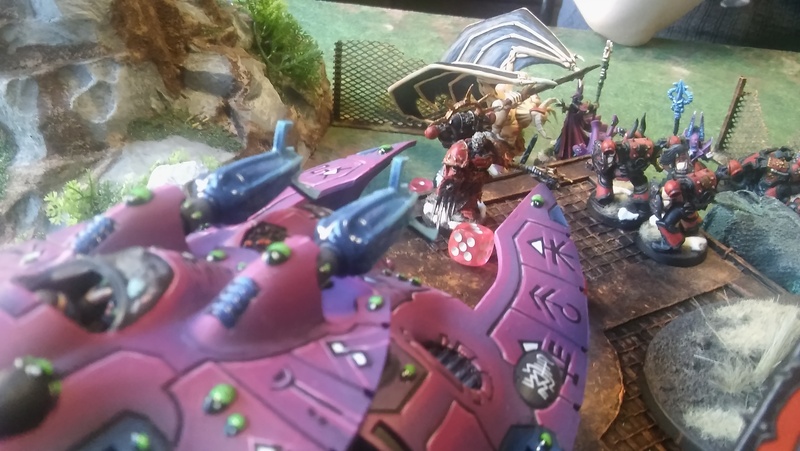 Ragnar Saw that the Heldrake survived, and was extremely enraged, because they missed the opportunity to strike down an important target, that may hinder the Corsairs counter attack. 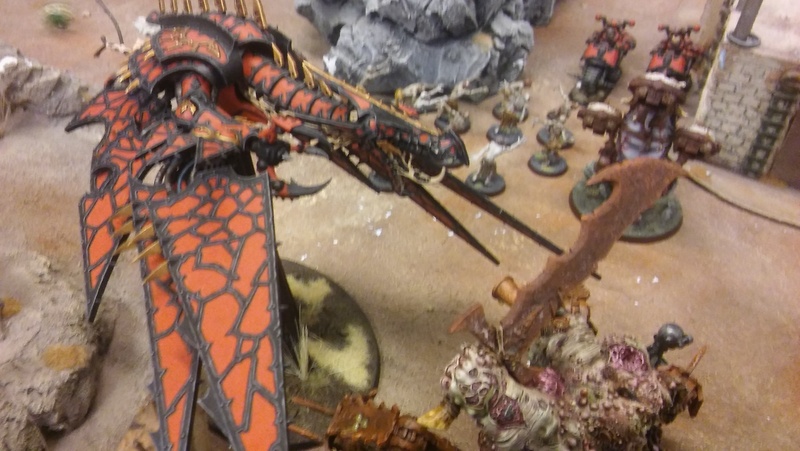 The Heldrake made his advance towards the Land Rider where Ragnar was. 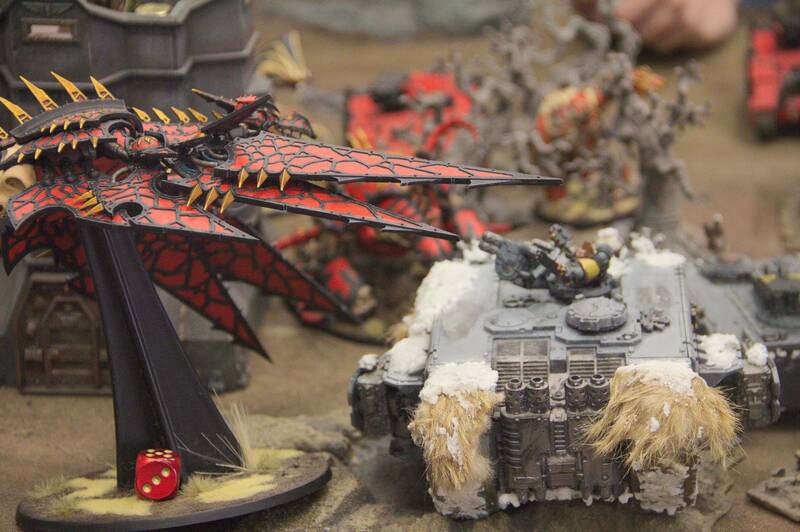 But before he could reach his target, a storm covered the Space Wolves line, hindering the sight of the heldrake. It was then, when the demonic machine noticed that the Wolves had an Librarian on their side. And it was non other then Njal the Stromcaller. The Drake changed his flight direction, and attacked the Rune Priest head on. Near by Corsair bikers saw that, and turbo busted towards Njal, to lend a hand in killing him of. Njal suffered great blows from his enemies, but he managed to survive the damage thanks to his Terminator armor, who protected him from some of the blows. In return, he managed to slay two bikers. On the other side of the battle field. 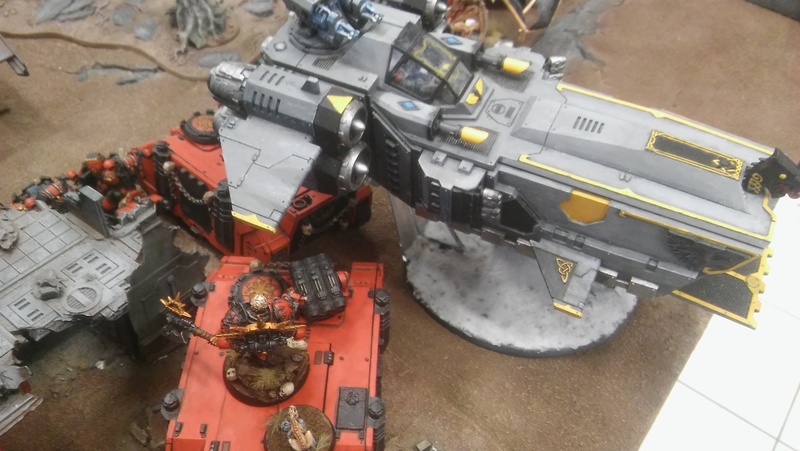 Huron, Daemon prince and the combined shooting power of the Corsair line managed to shoot down the Storm Wolf from the skies. 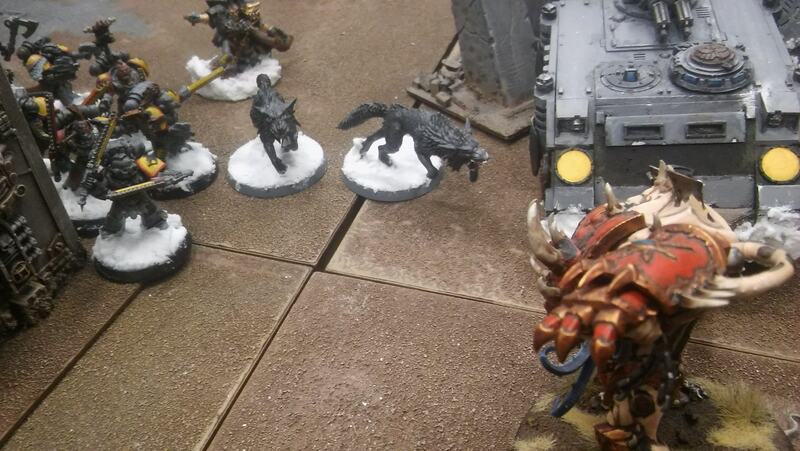 And thus securing their lines from the Space Wolves. After that, Hurons forces made their way towards the enemies. 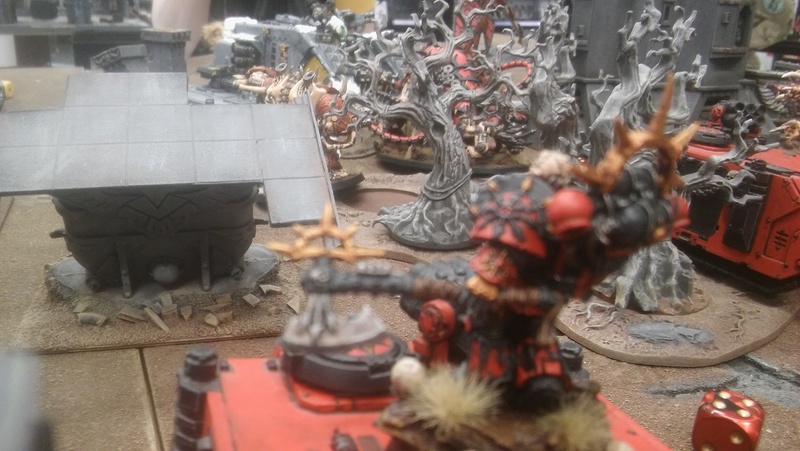 Ragnar seeing that his friend is in danger, ordered his blood claws to close any ways of retreat for the Corsairs bikers, and attack them from behind, while he will attack the Heldrake. With a battle cry, Ragnar jumped towards the Heldrake and tried to strike it down. But the machine just flew away, leaving the combat area. Njal tried to strike more blows on the bikers, but failed. 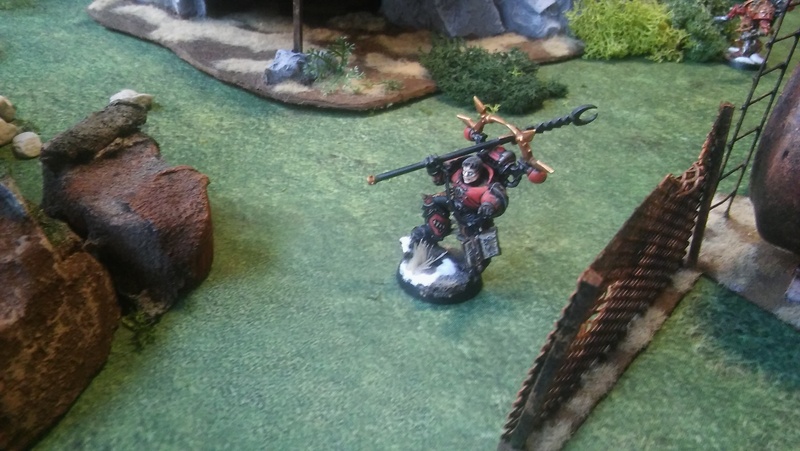 In return, the power fist of the biker Champion hit Njal right in the chest, sending him in to the wall. In return, Ragnar slew the champion him self. And letting his wolves tear the rest of the bikers apart. 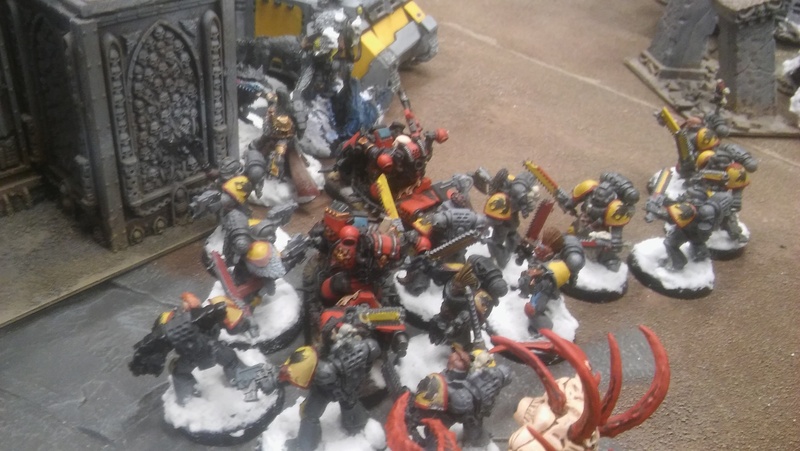 But the situation was still looking bad for the Space Wolves. 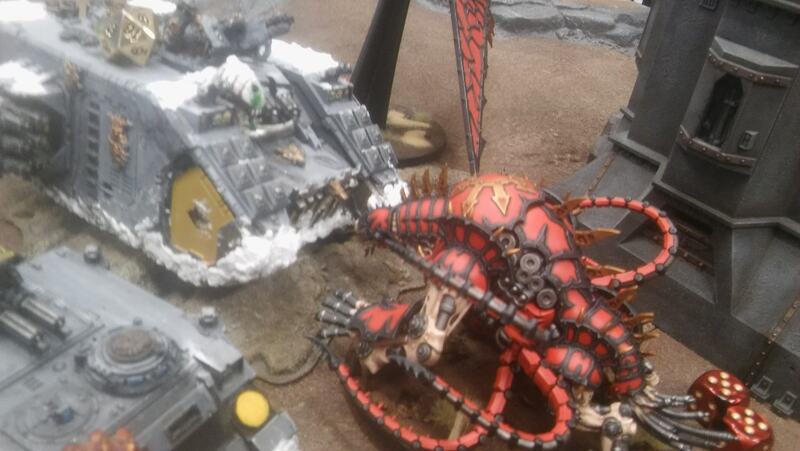 The Heldrake flew from the combat, only to support the Maulerfiend that was tearing true the armor of Space Wolves Land Raider. 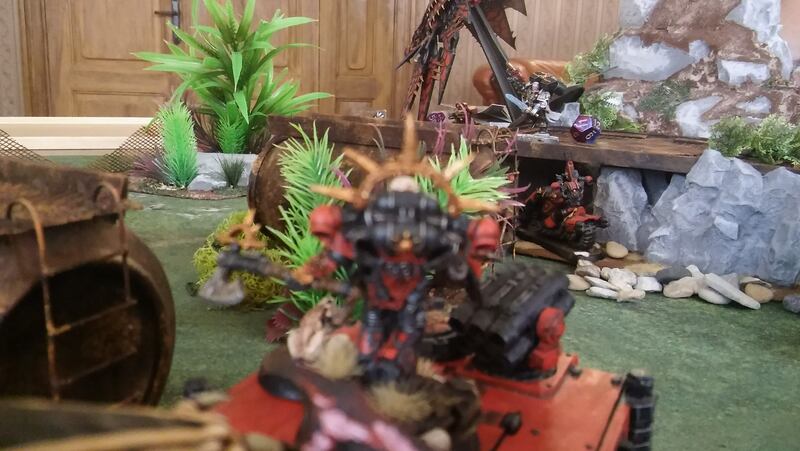 The Drake was ripping the machines guns, and the Fiend was penetrating its armor with his fists and tentacles. 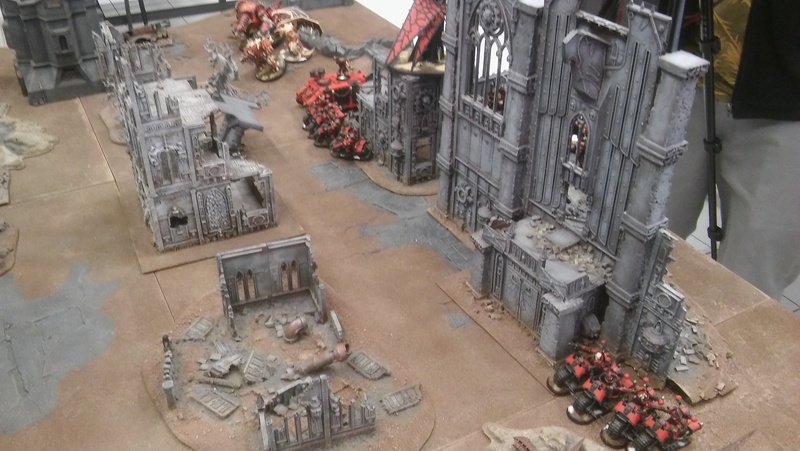 While looking on the Battle field, and waiting for Ragnars orders, the blood claws where ambushed by a chaos spawn. The beast ripped in to shreds 2 blood claws, and was about to kill even more. 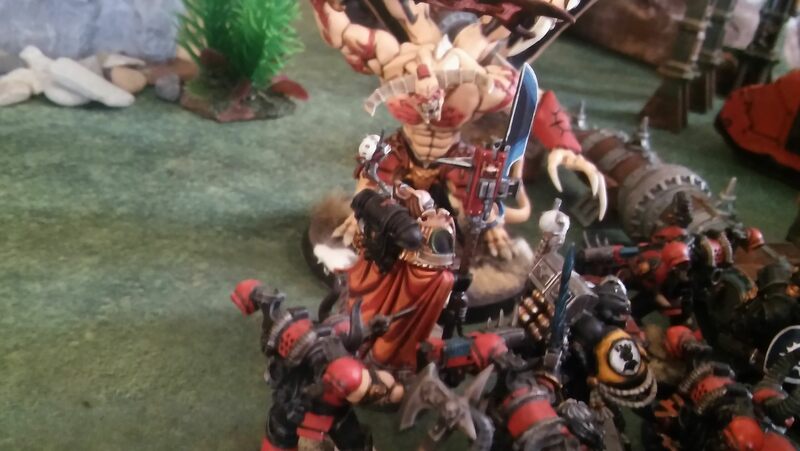 But before it could, a blood claws shoved his chain sword right on to the beasts eye and cut in in half. 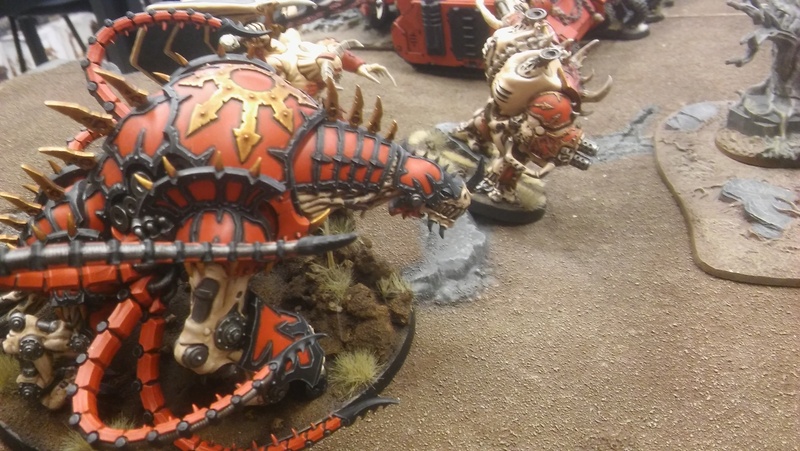 Ragnar charged towards the Hellbrute that was about to charge a Razorback. While charging he gave order for every one to disembark from their transports and attack the Daemon Engines. 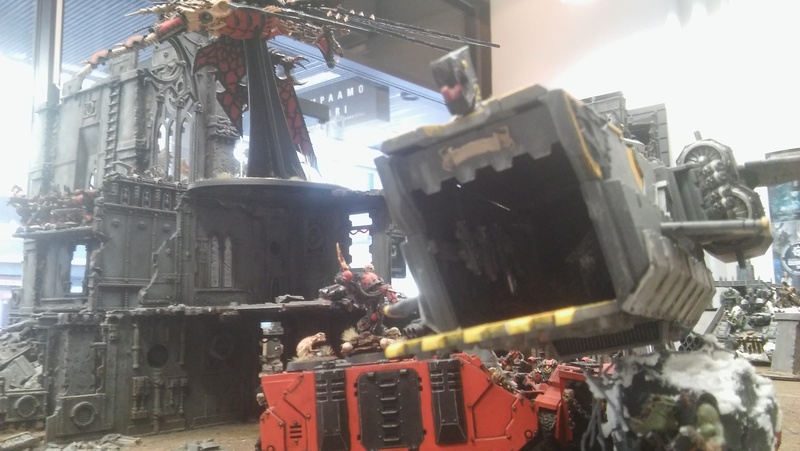 Thats when the Space Wolves trap closed. 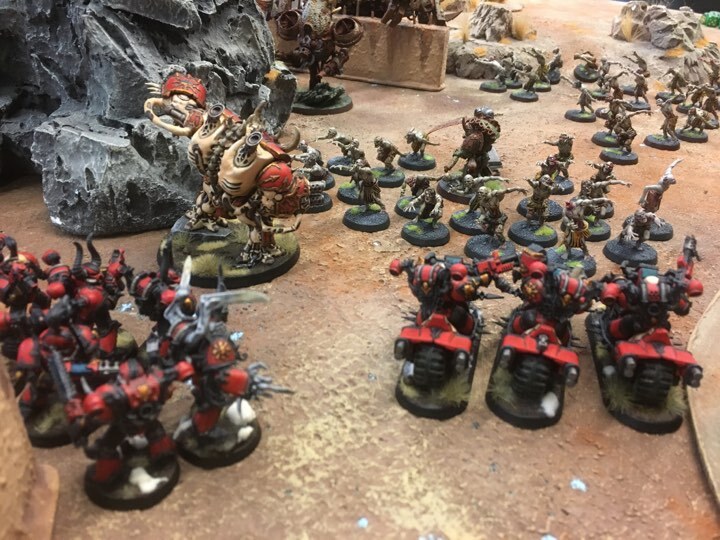 Huron was shocked how much more blood claws where hiding in the transports and just waiting for the surprise attack, and all of his forces where engaged in combat, leaving them open for a counter attack. 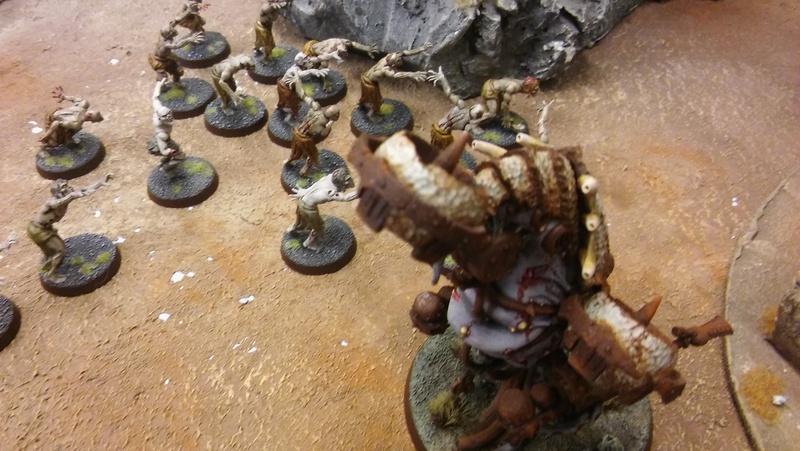 Ragnar him self slew the Helbrute, opening his way towards Huron. And then an explosion happened. 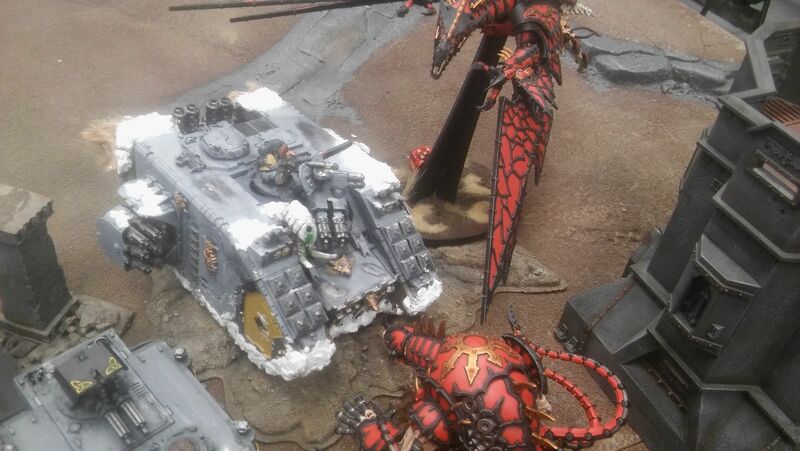 The Maulerfiend was successful in destroying the Land Raider, and was eyeing Ragnar. 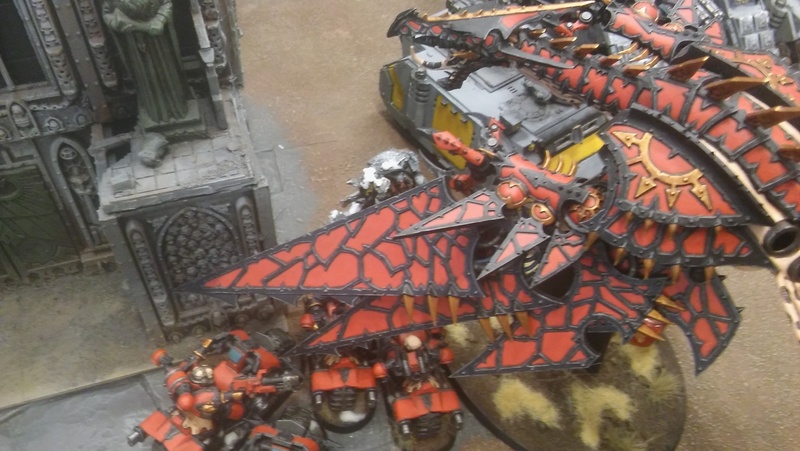 Besides the Machine stood the Daemon Prince, and the Heldrake was already attacking another Razorback, preventing it from shooting. 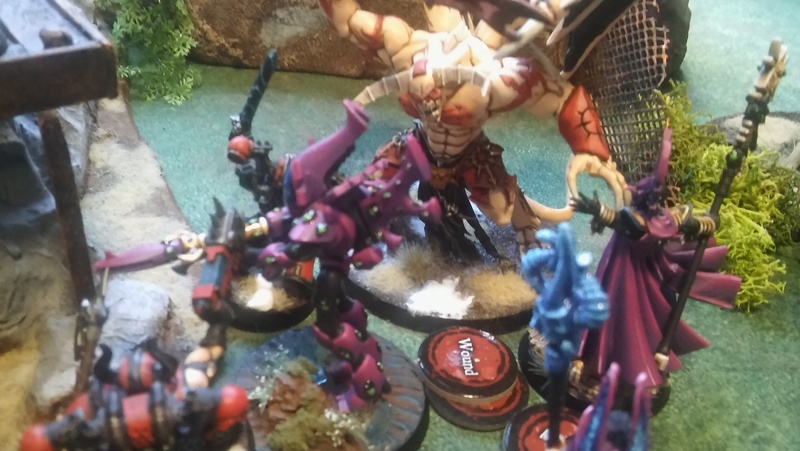 Huron came out from his Rhino, and killed off some blood claws, next to Ragnar, with Psychic power. Thus showing him self to Ragnar, and provoking the Wolf Lord to charge him head on. The Wolf Lord did just that. 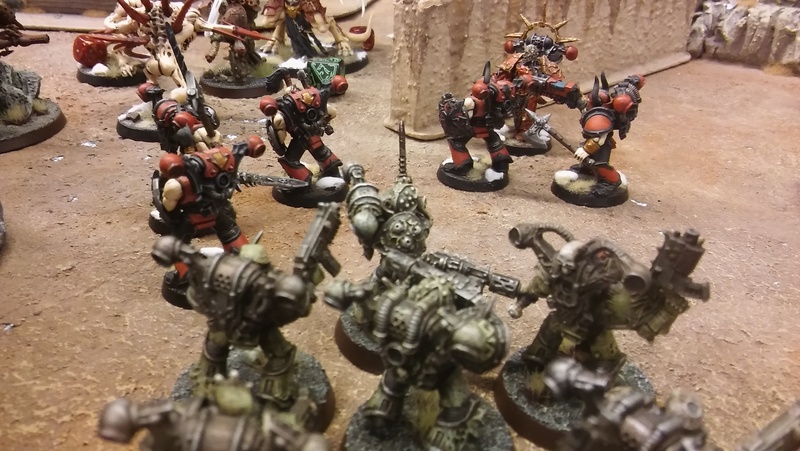 His wolves charged Ragnar first, while the blood claws charged the Chaos Marines that where protecting Huron. The wolves managed to make some damage on Huron. But when Ragnars sword was about to hit Huron, the Hamadrya jumped before Ragnars face, and he missed Huron. That gave the Tyrant an opening to shoot the Wolf Lord with Smite, thus smashing Ragnar in to the ground and leaving him unconscious. As Ragnar fell to the ground, so did his entire force. 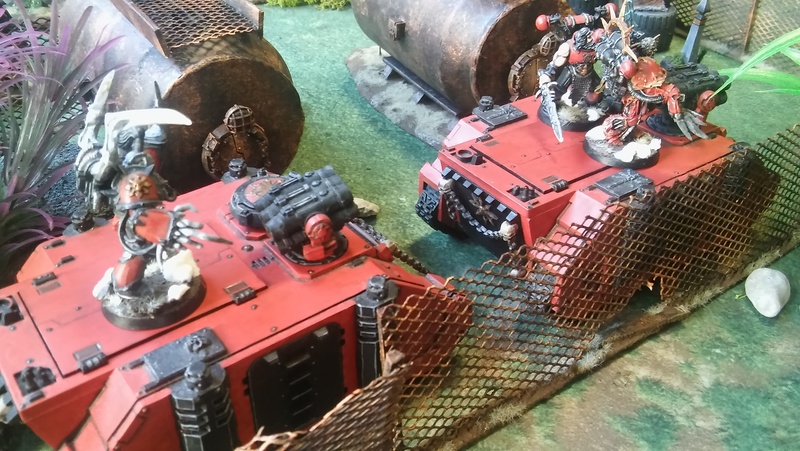 The Maulerfiend and Daemon Prince slew the remaining Blood Claws. 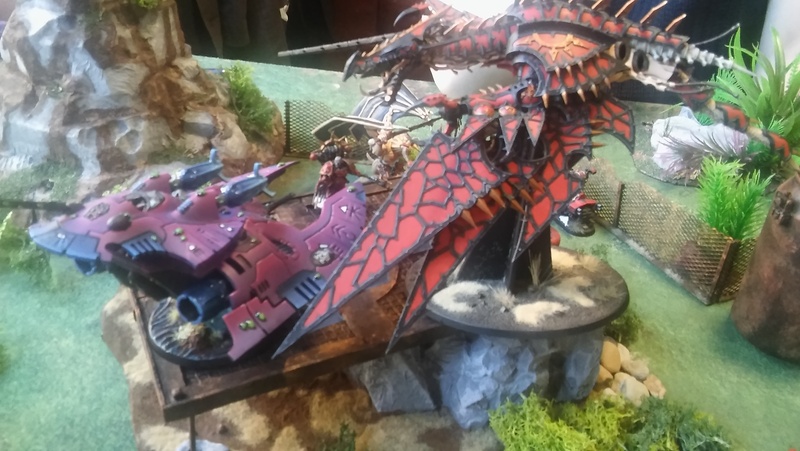 The Heldrake chased down all Razorbacs that tried to escape the field. Only Njal survived. And the last thing he saw, was how the Maulerfiend grabbed Ragnar in his tentacles, and brought him to Huron. Then they made way towards their airship and escaped the planet. Taking Ragnar hostage.